Middle Marriage: What's Your Ziplock Conflict? “I wish someone would write a novel about middle marriage,” a friend of mine bemoaned recently. I knew what she meant: a novel that would address that particular stage of life when you’ve been married for a while and the kids are no longer babies and maybe you’ve had a career change or a move or two, etc. And so when I read this article in the New York Times Modern Love column a few weeks back, I thought: Eureka! I’ve found it! Not a novel, but an essay that speaks perfectly to this phase of married life. If you haven’t already read the article, I won’t spoil it for you. Suffice to say that it’s about a couple that’s been married for quite some time and then, one day – in an airport security line – the wife totally loses it over (ostensibly) a ziplock bag. In my own case, while not exactly ziplock material, all of my fights with my husband boil down to some version of: I go too fast, he goes too slow. Everything. From how we load dishes into the dishwasher…to the various career choices we’ve made…to the very act of walking down the street. We probably have 742 versions of this conflict, but they all reduce to this. And that’s why I loved this essay. Because it acknowledges what most people aren’t willing to say about “middle marriage”: how very hard it is to stay committed to the same person over the long haul (which is probably why half of all marriages end in divorce, at least in America). It’s really hard work. And even when you do stay married, the recidivism rate is still high (as the author, Jane Hamilton, puts it so nicely). By which she means that even when you’re aware of the inappropriate reactions you have to the things in your spouse/partner/whatever which drive you nuts (pickle picker, anyone? ), you invariably fall back into those inappropriate reactions before too long. Which is why – like Jane Hamilton – one of the things that keeps my own marriage going is a sense of humor. We learned about this game from some friends of ours who did a pre-Cana course with the Catholic Church before getting married. The priest sat them down and had them both list all the things that drove them crazy about each other. After hearing each item, the other partner was only allowed to respond: “Is there anything else?” The idea was to teach them how to both express – and tolerate – each other’s foibles. It’s a great ice breaker. Try it sometime. Oh. I forgot to ask: Is there anything else? One of my favorite tongue-in-cheek blogs is Stuff White People Like. Laugh-out-loud funny and so on point. 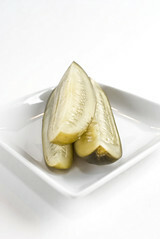 Image: Garlicky Dill Pickles by Kern.Justin via Flickr under a Creative Commons license. I am in that stage of which you speak – married 22 years. My husband and I were just talking about how we have about three fights, but we have them over and over and over, and if we could just figure out how to resolve them, we’d be… “bored,” I said. I don’t know if he agrees, but he did laugh. Yes, a sense of humor. Definitely.